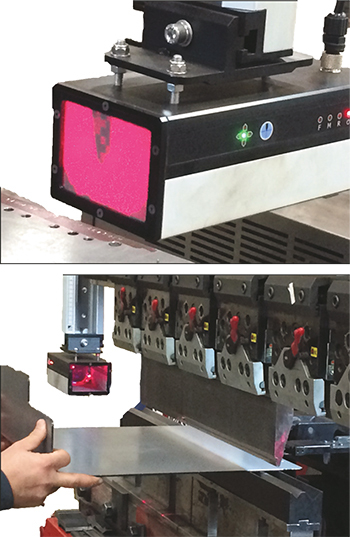 Contract manufacturer Dayton Rogers of Minnesota, LLC, recently implemented a new, advanced guarding system on its Amada HDS-model press brake. Developed by Lazer Safe, the new Sentinel Plus press-brake guarding system is designed to safeguard high-speed brakes such as the Amada HDS, which provides a maximum closing speed of 473 in./min. Using advanced camera technology and a rapid response time, the Sentinel Plus allows the HDS to safely operate at its maximum closing speed without any performance restrictions, enabling a speed-change point as low as 2 mm above the pinch point while ensuring that the machine can stop within a safe and monitored overrun-distance limit. The system comprises a laser transmitter and high-speed camera receiver fixed to the upper ram with an adjustable mounting bracket. Image processing enables tool-profile detection, automatic tool alignment and high-speed obstruction detection. The small 2-mm resolution of the protective field and rapid response time enable the operator to hold the workpiece close to the tooling while operating the machine at maximum speed. After a tool change and setup, the machine operator simply presses the tool-align button on the camera receiver. The camera scans the upper tool to determine tool-tip location, and then automatically adjusts the protective zone. If the tool tip is outside of viewing range, visual indicators on the graphical user interface help the operator adjust receiver position. With the tool tip identified, the system employs BendShield technology that dynamically configures the protective zone so that it envelops the punch tip. This avoids any gaps around or below the tool tip to keep it completely protected. The protective zone provides 2 mm of small-object detection resolution, and senses obstructions entering the hazardous area from any direction. This automated alignment process takes setup responsibility out of the operator’s hands and ensures that the protective zone is positioned correctly according to tool-tip location. Many bending operations at Dayton Rogers use multistage tooling with varying tool heights and tool profiles in the same setup. While this could prove challenging with conventional safeguarding solutions, Sentinel Plus scans the upper tools and automatically configures the protective zone according to the overall tool profile. The automatically configured muting point also accounts for staggered die heights to ensure safe operation and eliminate the possibility of a high-speed tool collision. Other features include automatic overrun monitoring, which ensures that the machine can, at all times, stop within a predefined safety-distance limit whenever a stop command is issued; and AutoSense technology that provides constant automatic monitoring of safe speed and overrun, and exceeds the requirements of B11.3-2012 by automatically monitoring machine control commands, operation and performance in real time. See also: Lazer Safe Pty. Ltd.